Of course you are — and you’ve come to the right place. In the text that follows, you will have a ringside seat to perhaps the most anticipated skirmish in science history, as four atomic adversaries duke it out for the coveted title of Most Awesome Subatomic Particle of the Millennium. In the red corner, supported by SLAC National Accelerator Laboratory in Menlo Park, California, USA, and weighing in at—well, nothing, really—is the photon. Yes, there are also neutrons in the nucleus. But they’re lucky just to be there, aren’t they? Look up any element's atomic number and you'll see which particles really count for something. Protons are the best, and scientists know it. After all, my name comes from the Greek word for “first.” Electrons? They’re fighting just to be in our orbit. What else? Those hadrons in the Large Hadron Collider (LHC) at CERN? Protons, of course. I don’t like to brag, but do you know about the Higgs boson? The “God particle”? The last undiscovered piece in the Standard Model of particle physics, the one scientists spent five decades trying to find? Do you know who finally discovered that particle? Protons did. When LHC scientists crashed us together, we made so many of those bosons that scientists couldn’t help but see them. There’s a reason they built a 17-mile accelerator — spanning two countries! — just for us. So maybe I don’t zip around the LHC at exactly the speed of light. I do get pretty close, and besides who would want to? I am a particle of substance. I have mass. Unlike some of you, I can stand up for myself. Push me and I’ll push back, converting energy into brand new gluons and virtual particles. I’m not some clumsy electron, speeding around just as fast as you please. What I am is creative — not to mention multitalented. Higgs bosons aren’t the only particles I can make. Need some neutrons? Some neutrinos? How about anti-protons or rare isotopes? Protons can make any of those: Just point us toward the right target. You might think I’d get tired of being so amazing. You might think that, like some neutron, I’d eventually wear out, give up and come apart. But I am rock solid. As far as scientists know, I will never decay. And if I do, I’ll still probably last longer than every planet, star and galaxy around. In sum, protons are collections of quarks and gluons, held together by the strong force, possibly for eternity. You can find them in everything built of atoms, and they’re key players in both medicine and basic research. In sum, protons are the best. while gravity’s got you subdued. don’t you know I reveal it all? In Star Wars, a laser from the Death Star destroys the peaceful planet. First out of our bag of tricks: If you are reading this on a computer or cell phone screen, you are welcome. If you want to forward this to a friend or loved one — and I hope you do — feel free to use email. And what do you think the “e” stands for, anyway? Without me, you’d be swiping on a touchscreen or banging on a keyboard to do what? Generate neutrons, protons or photons? I don’t think so. And if you are sitting down, you are also welcome. Because without the electronic bond, you’d fall right through your chair to the floor … and then through the floor … and so on. All the way down — now there’s a disappearing act! In fact, I’m so important to everyday life that I was the first elementary particle to be discovered by scientists, a feat performed by J.J. Thomson in 1897 for which he received the Nobel Prize. In 1911, we electrons paired up at low temperatures to perform our superconductivity dance for Heike Kamerlingh Onnes. We zipped so fast through that mercury: Now you see us, now you don’t! Another Nobel Prize. It took scientists 46 years to explain that dance, thanks to our deep understanding and clever use of quantum mechanics. That’s the thing. We electrons are genius magicians, always coming up with new tricks to amaze. But we’re also genius entrepreneurs … always providing new technologies to benefit humanity. Your other subatomic particles neither amaze nor innovate, playing the vaudeville circuit while our name is in lights on Broadway. We’re neutral, not unbiased: Revealing science secrets as we scatter, neutrons are worth our weight in the gold we create. Since then, our brilliance has grown by leaps and bounds. Thanks to fancy inventions like high flux fission reactors and the spallation neutron source at Oak Ridge National Laboratory, scientists can free us from our nuclear dwellings to form neutron beams, which help them see atoms dance and electrons spin. True: X-rays are handy for figuring out the atomic structure of materials. But neutrons find things that escape even them, including tiny hydrogen atoms, even those hiding among heavy atoms! Our penetrating power gives scientists “neutron vision” to see water in an operating fuel cell, oil in an operating engine, and problems in your smartphone battery that does not hold its charge. So … who wins the Subatomic Smackdown? We’re moving the final round out of the ring and into the social sphere. Which particles will go down for the count and which one will take the prize? You decide. On March 30, follow the blow-by-blow on Twitter at #SubatomicSmackdown and join a corner to support your favorite particle. But remember: We want a good clean fight, so let’s keep those tweets above the belt, everyone. Tally your points and submit your scorecard on Smackdown Day via a Twitter poll hosted by @NationalMagLab. The champion will be selected by majority decision. 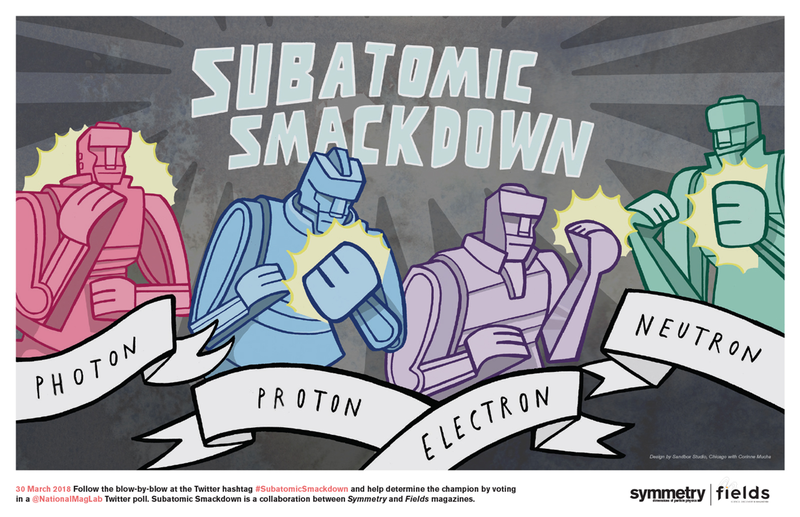 Check out our printable poster for the Subatomic Smackdown. Editor's Note: Subatomic Smackdown is a co-production of Symmetry magazine and fields magazine, a publication about high magnetic field research produced at the National High Magnetic Field Laboratory.